Should devotees think they're sanctifying people's residences by standing at their doors? It seems easy to fall into the trap of thinking, "I'm a devotee. Whatever I do is good for everyone." Some early ISKCON members used this rationale to "liberate" flowers from other people's gardens (for Deity worship) and similarly "liberate" vast sums of money from others ("for Krishna") through highly questionable means. This sort of behavior is known in non-ISKCON terminology as "theft" and "fraud." But real saints, truly spiritually advanced persons, are humble. They don't see themselves as especially powerful or qualified (or above state and federal laws). They just know they're completely dependent on Krishna, and that Krishna is always with them. Out of compassion, they make themselves (and, by extension, Krishna) available to others. And if milk is available for the asking somewhere, they're grateful to Krishna for sending them to the right door and thus help them go on living. Those on a high level of Krishna consciousness also never think they're separate from Krishna; they do everything in a mood of service to and partnership with Krishna, Who directs them, "go stand at the door of such-and-such householder. It's milking time." As Srila Prabhupada said, "Krishna tells me personally what to do." People in general thought Sukadeva Goswami was some kind of crazy freak; he went around naked, apparently oblivious to the world around him. Yet he was the most qualified person to speak on the pastimes of Lord Krishna in Srimad-Bhagavatam. At that time, over fifty centuries ago, it was still customary for householders to give charity to whomever asked for it. There was still a class of genuine sadhus/renunciants/holy men who had no fixed residence but would travel and show by example how to surrender to God and remain detached from worldly affairs. Nowadays householders keep their doors and windows locked to keep out anyone appearing to be a crazy freak, since that's probably what they are. 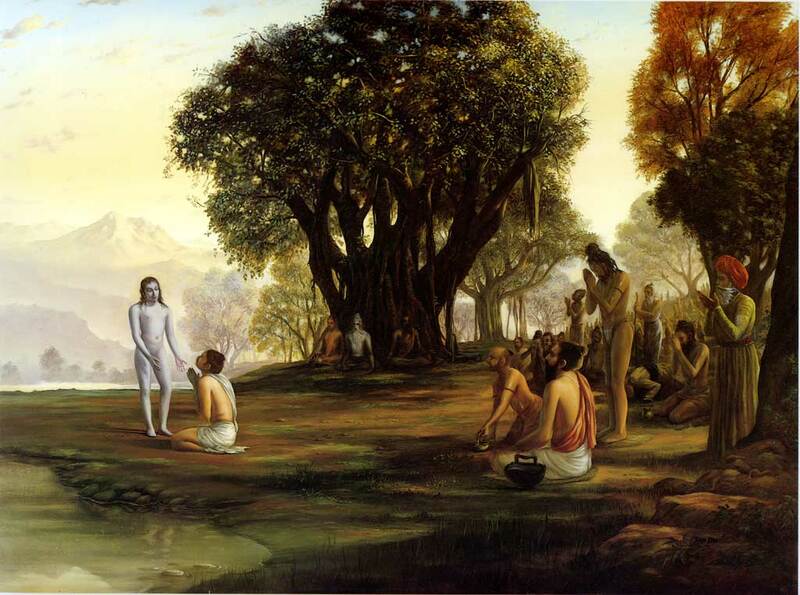 Sukadeva was so Krishna conscious that he even looked like Krishna – a sign of a highly advanced person. And by the householders' mere willingness to give some milk to Sukadeva — whether they thought he was a freak or not — they made spiritual advancement. As far as we're concerned, though, adopting Sukadeva Goswami-like behavior should only be done after performing a multi-point motivation check.